It’s been an exciting year for Northern Ireland actor Kerry Rooney; he’s already been to Buckingham Palace to collect his MBE for services to older people and drama, and next week he will be recreating another rags to riches story in hit musical Me and My Girl. Kerry is the Director of local theatre company Kaleidoscope. 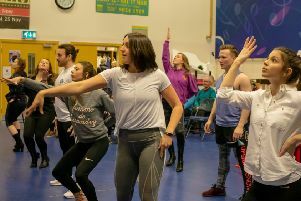 As well as producing their own shows like Pride and Prejudice and Talking Heads, the company uses drama as a way of working with groups like older people, teenagers and young people with disabilities. This is Kerry’s first show with the St. Agnes Choral Society and he’s loving the experience so far. “It’s great to work with a company like St. Agnes, they are so friendly and welcoming to everyone, they are also an incredibly talented and hard working group. You can catch Me and My Girl at the Grand Opera House from Tuesday May 9 - May 12.